Posted on March 2, 2019 by Farrah M.
I first read The Alchemist when I was around eleven or so. The book was confusing to me, and although I enjoyed it, I felt as if I was missing the bigger picture in some way. The book contained a lot of symbolism and themes that I was slightly too young to fully comprehend. Revisiting this six years later, I understand this book to be more than a fantastical adventure across Africa towards untold riches and going through trials and tribulations to come out on top. It is deep and the message resonated with me after I finished reading it. This novel is not about the practice of alchemy or the journey of a young man, Santiago. At least, not solely about either of those. The main idea, or theme, is how fear often controls people. The novel proposes the idea that everyone has what it calls a Personal Legend. A Personal Legend is a goal that the universe has put out for someone or a dream they want to accomplish. This is supposed to bring someone ultimate satisfaction for completing it and in order to continue living a satisfactory life and achieve happiness new Personal Legends are continuously set out after one has been completed. However, throughout the book examples are shown of people who are often too afraid to fulfill their Personal Legend, and thus find themselves stuck in an endless routine, or feeling empty as a result of the fear holding them back. Although following your Personal Legend can come at a price, like Santiago losing all his money while in a foreign country, this is the universe testing people and seeing if they are truly strong enough or dedicated enough to keep going. It rewards people who push past obstacles or get up to continue trying even when they fall. Coelho is trying to encourage the readers of the story to go out and experience their own adventures, fulfill their own Personal Legends, lest you fall into a cycle, doomed to dissatisfaction. Santiago is someone we look at as a reflection of ourselves. He has a comfortable life living in a certain way without changing, but his life is stagnant. Until he makes that decision to look at signs being given to him and taking a leap of faith to begin his journey. At first, it does not go well. He goes to a foreign country, loses nearly all his money to a con man, and has nothing but the clothes on his back. However, he begins working for a crystal merchant, and over time gains money. Although he is deciding to go back to Andalusia, at the last minute he decides to continue his journey to completing his Personal Legend in Egypt. He faces many hardships, almost dying along the way, but eventually, he makes it back to Andalusia, where he finds treasures waiting for him. The story as a whole is actually inspiring. It shows that achieving your goal is not easy, nor should it be. But it is rewarding seeing it through to the end, and the satisfaction of fulfilling a goal that you worked hard to achieve is (in Coelho’s opinion) the way to have a happy, good life. 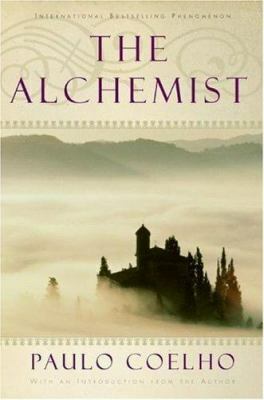 The Alchemist by Paulo Coelho is available for checkout from the Mission Viejo Library. It is also available for download from Overdrive.